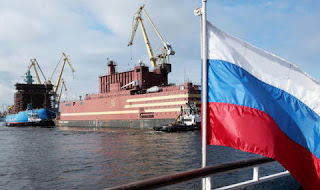 The first floating nuclear power plant in the world, Akadémik Lomonósov, undertook his first trip from a shipyard in the Baltic Sea, with the city of Pevek, in Chukotka (northeastern corner of Russia) as a final destination, to contribute to the development of northern Russia. Akadémik Lomonósov is towed from St. Petersburg to Murmansk to load nuclear fuel and start its reactor, according to information provided by the Directorate of Construction and Operation of Floating Nuclear Power Plants (FNPP), a subsidiary of the Russian Federal Energy Agency Atomic (Rosatom). So far, it is planned that the reactors will be operational for the second half of 2018, although once the nuclear fuel is loaded and when the crew is on board, the Akadémik Lomonósov will be towed to the seaport of Pevek, according to the calculations made, mid-2019 when the second part of the route should begin. The plant, which is moved with the help of tugs at a speed of six kilometers per hour to the Russian city of Murmansk, can also desalinate the water and produce up to 240 thousand cubic meters of fresh water per day. The period of exploitation of the unit is 35-40 years. Pevek in Chukotka, is the northernmost city in the country on the shores of the Arctic Ocean, there is the only nuclear power plant in the world located in the permafrost zone, however, it is obsolete. This Russian region is one of the largest gold extraction centers and is difficult to access. The ship, which was named in homage to the famous Russian scientist of the eighteenth century, Mikhail Lomonósov, has two reactors of 35 megawatts each, said the Sputnik agency. According to estimates of Rosenergoatom, from 2020 Akadémik Lomonósov, or as it is known in the company: Plavuchka (floating in Russian), will begin to supply light and heat to the inhabitants of Chukotka. The boat is capable of providing these services to a city with a population of more than 200 thousand people. The idea of building a nuclear power plant on a barge is not new. China and the United States have outlined the same project, but they have never made it happen. That honor has been taken by the Rosatom Company, dependent on the Russian government with its Akadémik Lomonósov. Under construction since 2007, it has taken 11 years and 232 million dollars to become a reality, and its mission will be to 'float' through the Baltic Sea bringing energy to different areas. However to think of Russia and nuclear energy is to immediately think of the Chernobyl disaster, unparalleled in the world of nuclear power plants. And the idea of seeing a nuclear plant moving through a marine environment that could take it to a halt certainly terrifies Greenpeace and other groups dedicated to the protection of the environment, especially since the Akadémik Lomonósov must be towed, because it cannot move autonomously. The concept of something nuclear going from ocean to ocean is certainly disturbing because, what happens if one of these floating power plants sinks? Would it be a greater environmental disaster than an oil tanker dumping oil?